It’s not every day you see an alligator on a golf course, but the casual nature of this guy strolling along makes me think it’s more common than it should be. Footage captured on Fripp Island, South Carolina, shows an absolute monster of a gator walking across a golf course in a what is apparently quite a normal occurrence for the resort. The appropriately nicknamed Sherman the Tank reportedly takes these little strolls fairly often, walking from pond to pond on the course and definitely not freaking out everyone who sees him. Just look at the deer who carry on with their deer business not at all worried that Sherman might decide to lunge at them. Then again, looking at the size of him, I’m not sure Sherman can lunge anywhere. Not on land at least. As Fripp Island Resort’s Head Naturalist I am on call to respond to a variety of wildlife issues. I was called to this gator moving down the golf course. Luckily, this large American alligator was on his normal walking route and no action was needed by island security or myself. Sorry, but ‘his normal walking route’? 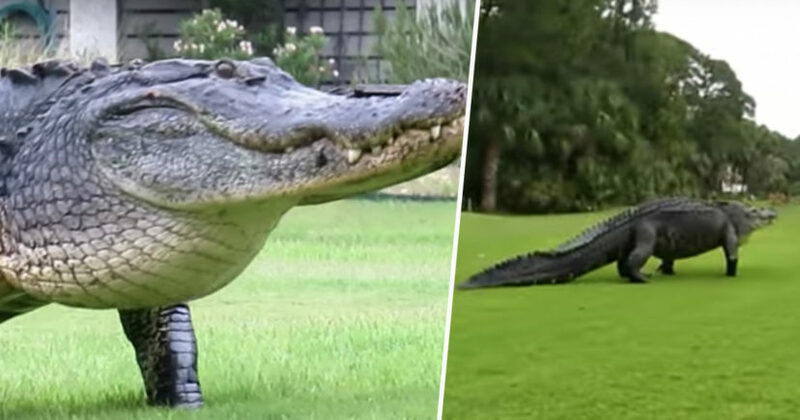 Never thought I’d see the day where a giant gator casually strolling past deer and people playing golf was ‘normal’. This bull roams from pond to pond each spring and summer so he can hunt prey and mate with the multiple females in his territory. We measured a spot he laid down at and he is just shy of 12 feet long. This gator is at the very least 30 years old, but may be 60 years of age or more. He is seen with some regularity by golfers and residents who live on the course, and he does not pay attention to humans. Guests and residents on Fripp Island are well educated on gator safety and respect, and as long as people keep their distance and don’t feed him, we can expect to see Sherman the Tank as we’ve been calling him that for years. Sherman the Tank may also have a twin brother, as another humongous alligator was spotted a few miles south of Fripp Island, at the Buffalo Creek Golf Club in Palmetto, Florida. What is it with gators and golf courses? Are they all just working on their handicaps and going for birdies? The footage was shared by Charlie Helms, who was probably just enjoying a leisurely round of golf when his game was interrupted by a massive reptile strolling across the course. Charlie could be heard saying ‘that is the biggest frickin’ alligator I have ever seen in my life. Jeez this thing must be 15 feet long’, while another man added ‘you gotta be kidding me’. Alligators are of course historically linked to golf courses, as documented in the 1996 Adam Sandler film Happy Gilmore, which has also been voted his best.